In the early 1970s, Jim energetically pursued Muppet television projects, and, inspired by his live appearance in Las Vegas with Nancy Sinatra, Jim was developing a show for the Broadway stage. When he went out to Los Angeles with his producer Diana Birkenfield in October 1972, he met with Larry Gelbart, then known for both his television writing and his contributions to Broadway’s A Funny Thing Happened On The Way To The Forum. Within weeks of that meeting, Jim noted that he had made a deal to do a live show at Lincoln Center with Gelbart’s involvement. By February of the following year, however, Jim noted, “Gelbart out of B’way” and brought in screenwriter Marshall Brickman to continue work on the show. After several years of development, Jim moved away from the project in order to put his efforts into The Muppet Show. But the idea of a live show intrigued Jim, and he continued to think about it. Almost ten years later, Jim called Larry Gelbart who had by then created the hit television show M.A.S.H. and was working on the feature film Tootsie. Jim had started on a project for the stage written by Hugh Wheeler called Bodo featuring medieval characters, some designed by Brian Froud. 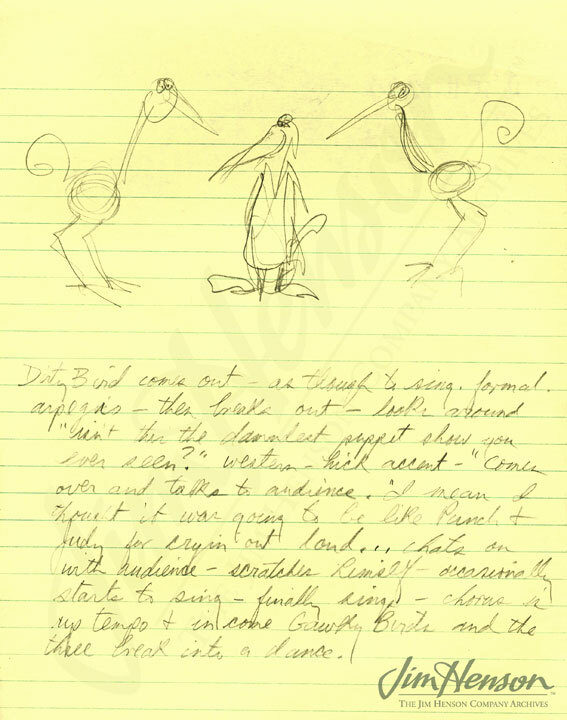 The day before his talk with Gelbart, he noted in his journal “Drop Bodo”. Clearly, he was not giving up on the Broadway Show idea, but wanted to do something different and thought Gelbart might be a good collaborator. 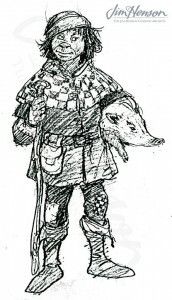 In July, he and Gelbart met with Brian and Wendy Froud and started discussions about a new project for the stage that would also feature medieval characters. Over the next year, a writing deal was negotiated with Gelbart for what was then being referred to as the Medieval Show, but by 1983, Jim was looking into other writers, including Neil Simon. Nothing came of the Medieval idea, but in 1985, Jim began developing a different idea for a Broadway Show, this time in a more contemporary world. With a working title of “The Puppet Show”, it was to be an array of performances with a variety of music loosely strung together with a behind-the-scenes storyline focusing on the puppeteers and their personalities and relationships. Among others, Jim hoped to use performer Fred Newman as a central figure. While Jim never staged this show, it was clearly the genesis of the idea for his 1987 television pilot, Puppetman, which starred Fred Newman. For more information about the Broadway Show, see journal entry for March 7, 1973. For more information about Puppetman, see journal entry from March 1987. 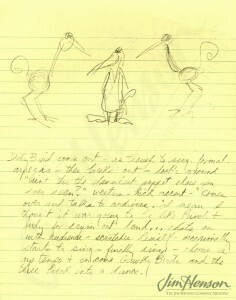 Jim’s idea for Gawky Birds for the live stage, early 1970s. Birds from Jim’s pitch for a Broadway Show, 1972. Brian Froud’s character designs for Bodo, 1981. 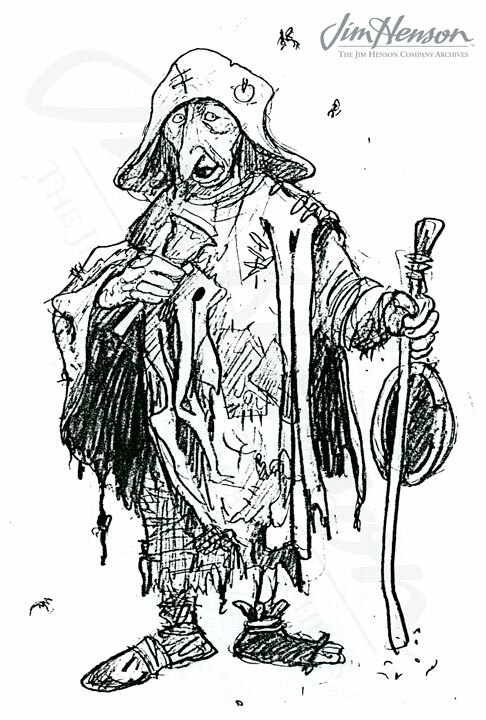 This entry was posted in 06-June '81, 1981, Muppet Show and tagged A Funny Thing Happened on the Way to the Forum, Bodo, Brian Froud, Diana Birkenfield, Fred Newman, Hugh Wheeler, Larry Gelbart, Las Vegas, Lincoln Center, Los Angeles, M.A.S.H., Marshall Brickman, Medievil Show, Muppets, Nancy Sinatra, Neil Simon, Puppetman, The Puppet Show, Tootsie, Wendy Midener Froud. Bookmark the permalink.